Observations on Efficiency | Life, The Universe and ... Everything! There I was ... hungry and in a rush. So I decided to stop by McDonalds. 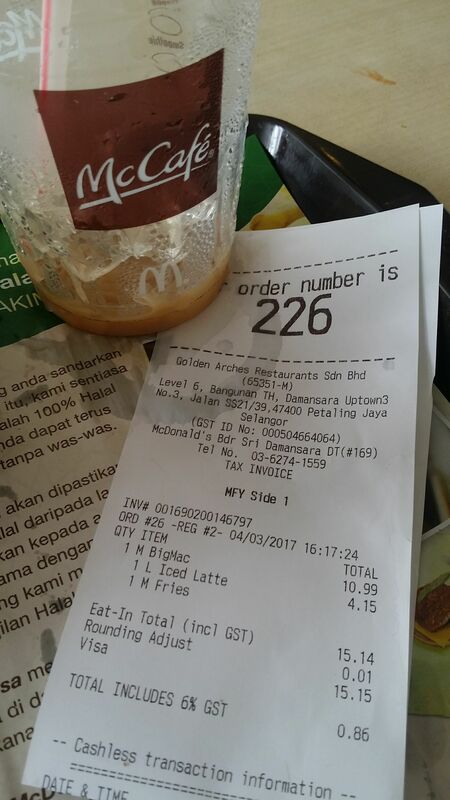 This is the McDonald's at Bandar Sri Damansara, Petaling Jaya. It's one of the better ones, well run, clean and easy to access. It was 4pm on a Saturday afternoon, and I was able to get parking by street -- it wasn't crowded. I've frequented the McCafe there a number of times, but haven't had food there for a couple of months. Well ... I ended up waiting 20 minutes for my food!! Usually ... the scene behind the counter is a beehive of activity ... with the staff amazingly not bumping into each other as they try to get the orders through. There would be a few counters open where cashiers taking orders. The order processing is computerized, and as your order is taken, the minions in the kitchen get through the process of preparing your burgers and stuff. Monitors display the outstanding orders. Timers for the fries go off at the precise moment. The cashiers will take your order, and prepare your tray to the side, while other staff watch for products to come out of the kitchen area and immediately fill up your tray. When the order is complete, the cashier hands you your food with a friendly "Thank you and Have a nice day!" (Okay I'm embellishing). If the queue of trays gets too large or the customer has been waiting too long the cashier will jump in on the action and start assembling your order, or start shouting to the kitchen chasing for a particular item. In short, it's organized chaos. But today that was not the case. Now they've implemented a new system (actually it's probably been there for some time but I've not noticed). A lone cashier takes your order. There's a big number printed on your receipt, you collect your order from a separate collection counter. A big monitor displays which order numbers are ready, so you can either hang around the counter area or sit down. Each staff does one thing (Ford's "Specialization of Labour"), and gets through processing their part of the supply chain efficiently. Everyone was manning their stations and things were orderly. So what went wrong? Well maybe in getting everyone to focus on doing one thing well, they became focused on only their task. Nobody was looking at the big picture, and more importantly nobody was taking care of the customer -- a task which the cashier unknowingly handled previously. Now once you've paid, the cashier simply moves on to the next person, and you're left on your own. There is no visibility of the bottlenecks, no real-time gauging of customer satisfaction. Probably a large order came through and caused a bottleneck somewhere, but because everyone was focused on getting through their task, nobody was aware of the of the problem. The customers are left waiting unattended, and while the frustration was obvious among the customers, the staff were oblivious to it. To make it worse by the time my order was called, it had been sitting at the collection counter for two minutes, getting cold. Yeah, I watched it all the way from the kitchen. The person who's job it was to update the system and confirm the orders were ready was actually overwhelmed, but I think due to too much focus at the task at hand, the person was unaware of that fact. So here's a thought ... you can improve and fine tune your systems to perfection, but it's important to never lose sight of the big picture ... or the customer. PS: Fortunately, the lattes are still prepared at the McCafe counter, so I got to sip my coffee while observing all of this.